Man, I want a Loki or a Coal Patch Together toy. Is that true?? Or is Coal hiding something? I love the boys. They remind me so much of the kids I babysit. Another wonderful page! Well worth the wait. 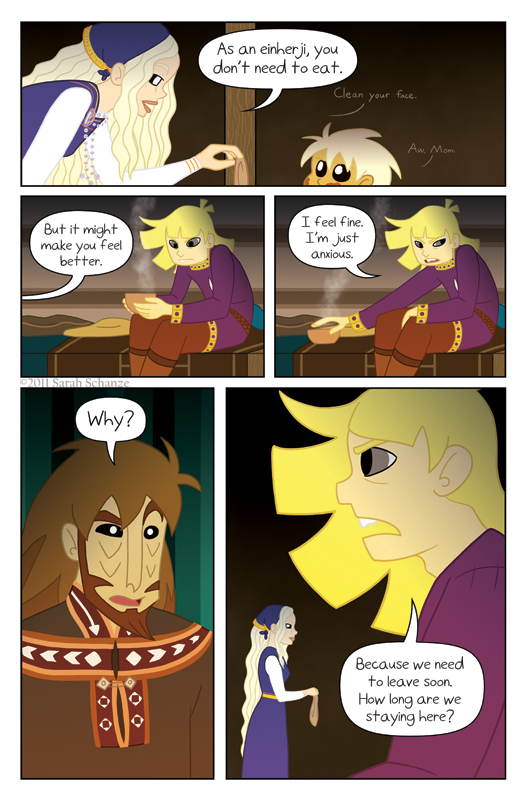 ^_^ I really like the first panel, as well as Sigyn’s eyes in the last. I sense a ‘talk’ coming xD. Will there be anymore interview-style pages after this? Hahaha! Glad you liked his answer. ;3 Thank you! So wait, Loki will answer questions next week like Coal did (or technically didn’t)? Great comic, looking forward to Coal vs Sigyn. I know Loki is a shapeshifter, but does Sigyn have any powers? No, if you vote on TWC this week you can see Loki answering some questions. Well, as much as he can. XD As for Sigyn…well, you’ll see. ;3 Thanks! What do you like best in each of your children? Poor Coal. Just a teensy bit of misdirected hostility here. Is somebody missing their Mommy? Awww, maybe! Maybe not. HMM. No food. Not an afterlife I wan’t to be apart of. Those kids seem a little immature and messy to be 10-11. They seem more like 4-6 year olds. I want to know how Loki won the favor of his lady wife. ^_^ Also what is a patch together toy? That’s actually a bonus comic I want to make for the first volume’s print edition, hopefully. And Patch Together is a website where people can submit designs for figurines or plushies and people vote on it (you have to register to vote though) and if the design gets enough votes, and then enough pre-orders, they make it. It can take a LONG time to get the figurine but it’s still pretty neat. Alright, now that someone mentioned it, I am putting ‘make a Coal plushie’ on my to-do list. It’s just such a great idea, I can’t let it pass by! But I won’t have time to make it look super awesome, so… FELT AND BAD SEWING SKILLS, HERE I COME! lol. Oh yay Loki answered one of my questions! And Coal is such a -grump-. He needs to cheer up. Aw, thank you so much! I’m glad you’ve been enjoying it. :3 And yeah, even if Loki understood, he probably wouldn’t care. a good mother, is a mother to all. coal should relax while he can, ’cause i’ll bet soon there wont be time to. You would be right about that. :3 Actually Coal never relaxes ever. You’ve given me an excuse to drag it out of hiding, and there it sits on my computer, just waiting for me to pick it back up and enjoy Loki’s pranks. XD … And the fact that he gave birth to the Sleipnir, hee.